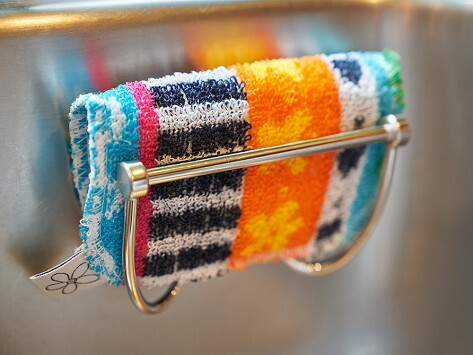 A Skoy scouring pad does scrubbing and clean-up jobs in an eco-friendly (and much more colorful) way. This stainless steel sink holder is the perfect resting place for a scrubber when dish duty is done. The base adheres to a surface with double-sided tape and the holder magnetically connects. Dimensions: 4" x 2" x 2"
Unlike other products like this, it doesn't lose its suction. Very well designed. I really like having a place to store the scrubbies! Great for keeping my sponges aired and dry. This scrubbing pad holder adds an elegant touch to my sink., but it likes to wander to the bottom of the sink, due to not understanding one aspect of the instructions. The placement of a small metal tab must be placed at the bottom, and no where else! The function of the metal tab is to keep the magnet from sliding down the sink. Such a little detail to be so important. The magnet is so strong against the sink that I can’t get it off of the sink. I will try harder to release the magnet, when I have time. Now that I am giving everyone A hint, It should work fine for them. Otherwise I think the holder is excellent. The magnet is certainly strong enough to hold any pot scrubber. The Skoy scouring pad is a fresh take on the traditional scrubber, which is what co-founders Michelle Lundqvist and Karen Petersen are all about making. They’ve been at work for more than 10 years giving folks updated, works-better solutions for the standard kitchen staples. Their durable scouring pads do scrubbing and clean-up jobs in a non-abrasive way that works for most surfaces like non-stick, stainless steel, glass and more. They’re made in Poland from cotton thread remnants from the toweling industry that are hardened with a non-toxic resin. A Skoy pad is longer-lasting—like, five times longer—than a typical scrubber and can go through the dishwasher to clean up. When dish (or counter, or any other scrubbing) duty is done, pop one in its own magnetic sink holder to dry out for the next round.